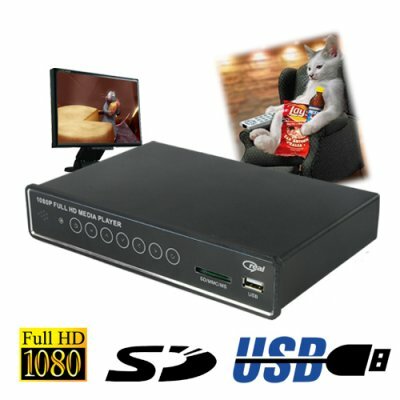 Successfully Added 1080P Hi-Def SD / USB Memory Card Media Player to your Shopping Cart. 1080P Hi-Def SD / USB Flash Memory Media Player lets you watch high definition (1080P) movies and TV shows from SD cards and USB drives. Now you can take those high-def 720P and 1080P movies and TV shows you downloaded off the Internet, transfer them onto an SD card or USB drive, and then play them on your HDTV with this incredible flash memory media player. What's more, there's no need to buy or install a HDD (hard disk drive)! If you love watching HDTV, you're going to love this HD media player. It effortlessly plays 1080P videos which have a 1920x1080 screen resolution. 1080P movies and TV shows are identical to Blu-ray DVDs in picture quality because they were originally copied from Blue Ray DVDs and saved in video formats like MKV, AVI, or RMVB to better facilitate Internet transfers. The good news is that this awesome audio video media player unit plays all the following hi-def video file types: MP4, MKV, MOV, MPEG, MPG, VOB, AVI, DIVX, XVID, RMVB and also plays MP3, AAC, WMA music files too! Sit back and have a great time! Pick it up, and you'll immediately be impressed by how solidly this high definition 1080P media player is built. Power it up, and you'll immediately be surprised at how user friendly the controls and menus are. Connect it up, to your HDTV, and you'll be stunned at the amazing picture quality and detail this unit delivers. Buy one of these HD media players right away before they go out of stock. Or buy a half a dozen and be the first seller on eBay to offer your customers this innovative and affordable solution for HD media. Brought to you by the leader in wholesale direct from China electronics - Chinavasion. Which type of cable will give me better picture quality: HDMI or Component (YPbPr)? There is no agreement here. If you search popular electronics forums you'll hear arguments for either side. Our suggestion would be to experiment. Since this product has both HDMI and YPbPr functionality, try each one in turn and to decide which connection offers the better viewing experience. How do I install an HDD into this unit? Unlike other media players, this unit does not require the use of a hard disk drive. All media is stored and played from SD cards or USB drives. How does purchasing this unit compare to buying a Blu-ray DVD player? A Blu-ray DVD player will cost you several hundred dollars and thereafter each Blu-ray DVD movie you purchase will cost you at least thirty dollars. With this high definition media player, you can download 1080P movies from the Internet which are the exact same picture quality as Blu-ray DVDs (since they were copied directly from them) and watch them on your HDTV.